Avenue Of Peace is a memorial walkway, sculpture, and water feature set within the Boston Common to honour and celebrate the lives and values of Martin Luther and Coretta Scott King. As pioneers of the Civil Rights Movement and advocates for justice, they championed non-violent protest and worked toward peace. This interactive memorial engages the public with the story of their lives and mission, through a series of inscribed benches and an app that visitors can download. This memorial is not a singular sculpture, but rather a site for public contemplation and understanding. Peace, the cornerstone of their values, is central to the design of this monument. The public is invited to take a journey along the avenue. Stone benches, where people can sit and learn about the couple and their histories, will line the walkway. A mixture of evergreens and seasonal deciduous trees will be interspersed between the benches. 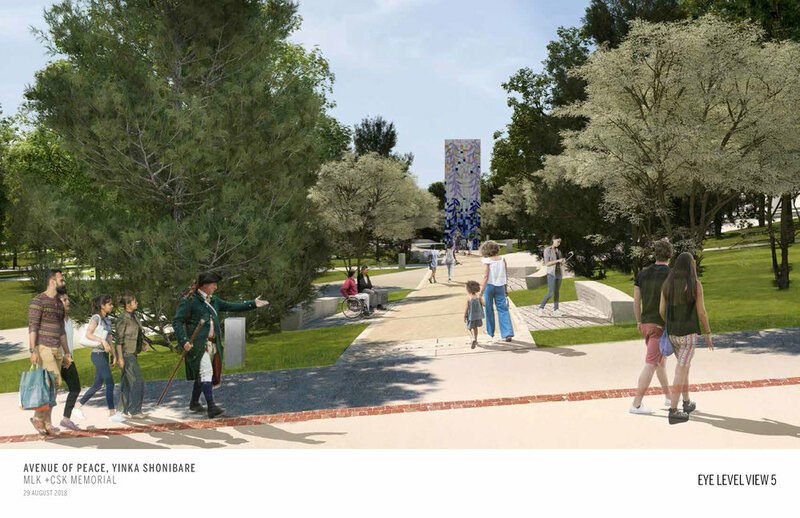 A fastigiate cultivar of the White Pine, called the “Tree of Peace” by indigenous peoples of New England, will symbolise the couple’s enduring values, whilst deciduous trees will mark the passing of time by changing colour with the rest of the park. 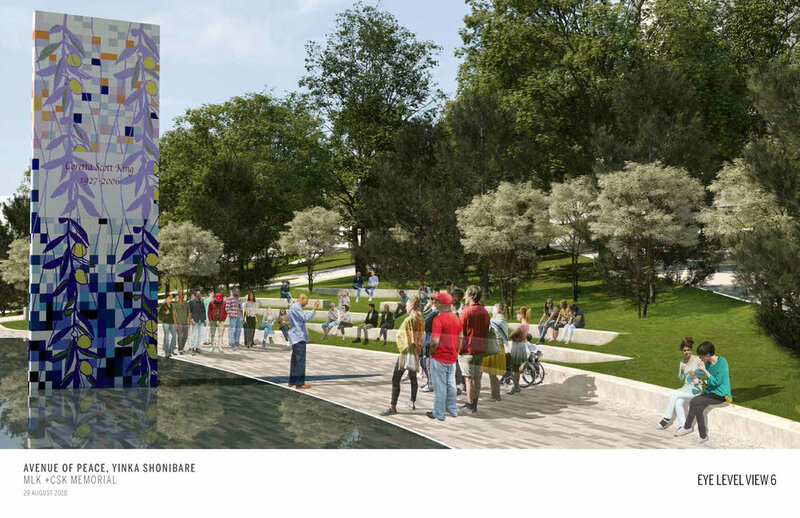 Toward the centre of the avenue will stand a tall fountain covered in colourful mosaic, set in the middle of a continuous oval pool lined with black granite. The mosaic design incorporates the couple’s names alongside olive branches that will remind viewers of peace as mosaic’s reflection shimmers in the pool. The space along the mosaic fountain and pool serve as an area for gathering. The public are invited to sit, reflect, learn, and contemplate on the lives and values of the couple, in a moment of stillness. They can watch and listen to accounts of some of the key moments in their life together, from crucial events in the Civil Rights Movement, such as the Montgomery Bus Boycott, to their visits to India where they met and studied with direct disciples of Gandhi. Approaching the avenue, visitors will see information posts which will ask them to download the app. As visitors approach from the east side, they begin to learn about Coretta’s life, beginning with her childhood growing up in Alabama, to her love of music which ultimately led her to Boston where she studied at the New England Conservatory of Music. As visitors get closer to the mosaic fountain, the narrative switches to her life after Martin’s assassination and her continued work with human rights movements. The west side of the avenue narrates Martin’s early life and the journey that took him to Boston. 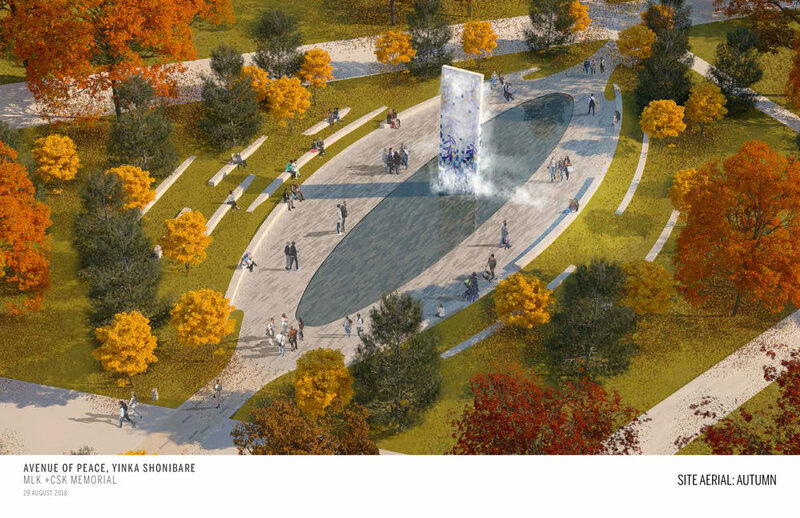 The memorial as a walk will evoke the long marches Martin and Coretta made for peace.